The Office of Student Conduct strengthens personal responsibility and accountability through investigation and resolution of alleged violations of the University Student Code of Conduct. The Office is committed to providing a fair and educational process that fosters the highest standards of behavior, student learning, and civic responsibility while promoting a safe environment that respects the rights of all students. Student Conduct strives to adjudicate cases of alleged misconduct in a fair, responsible and timely manner emphasizing respect, trust and integrity. Additionally, Student Conduct serves as an advocate for and resource to student victims of crime, illness, harassment, or other crises. The University community is committed to fostering a campus environment that is conducive to academic inquiry, a productive campus life and thoughtful study and discourse. The student conduct program within the Office of Student Conduct is committed to an educational and developmental process that balances the interests of individual students with the interests of the University community. A community exists on the basis of shared values and principles. At the University, student members of the community are expected to uphold and abide by certain standards of conduct that form the basis of the Code of Student Conduct. These standards are embodied within a set of core values that include integrity, community, social justice, and respect. Each member of the University community bears responsibility for their conduct and to assume reasonable responsibility for the behavior of others. When members of the community fail to exemplify these values by engaging in violation of the rules below, campus conduct proceedings are used to assert and uphold the Code of Student Conduct. The student conduct process at the University is not intended to punish students; rather, it exists to protect the interests of the community and to challenge those whose behavior is not in accordance with our policies. Sanctions are intended to challenge students’ moral and ethical decision-making and to help them bring their behavior into accord with our community expectations. When a student is unable to conform their behavior to community expectations, the student conduct process may determine that the student should no longer share in the privilege of participating in this community. Students should be aware that the student conduct process is quite different from criminal and civil court proceedings. Procedures and rights in student conduct procedures are conducted with fairness to all, but do not include the same protections of due process afforded by the courts. Due process, as defined within these procedures, assures written notice and a hearing before an objective decision-maker. 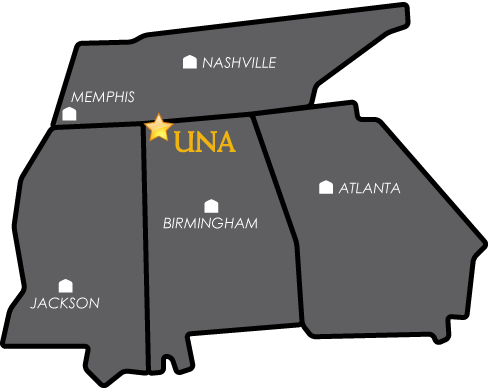 No student will be found in violation of UNA policy without information showing that it is more likely than not that a policy violation occurred and any sanctions will be proportionate to the severity of the violation and to the cumulative conduct history of the student. In the case of an emergency, CALL 911 for immediate assistance. Public Incident Report forms are not checked after business hours.